Maàlem Ba’kili Chouaib Contact: +34 644257027, eko@eko.cat. Maâlem Ba’Kili Chouaib was inspired by the music of Gnawa Master, Maâlem regretted “Hmida Boussou”; and according to the dictates of Gnawia Tradition, he was educated by “Mkadam” Abdelghani Chfakchi of Kenitra City. Mastering this spiritual musical style called “Mersaoui” in the “Tagnaouite” register (Sacred Repertory / Gnawa Lilas Therapeutic Ritual), it let him to become himself Maâlem at the age of 22 years, which is a young age and uncommon in Gnawa Tradition. He began his artistic career as a singer and guitarist with the band “Wanga”, and celebrated many “Lila Gnawia” (The Gnawa Ritual Nights) with his troupe of Koyos “Wolad Houssa” (dancers, singers, karkabo players, “gnawa metal castanets). He is also the founder of the band” Beldi “. 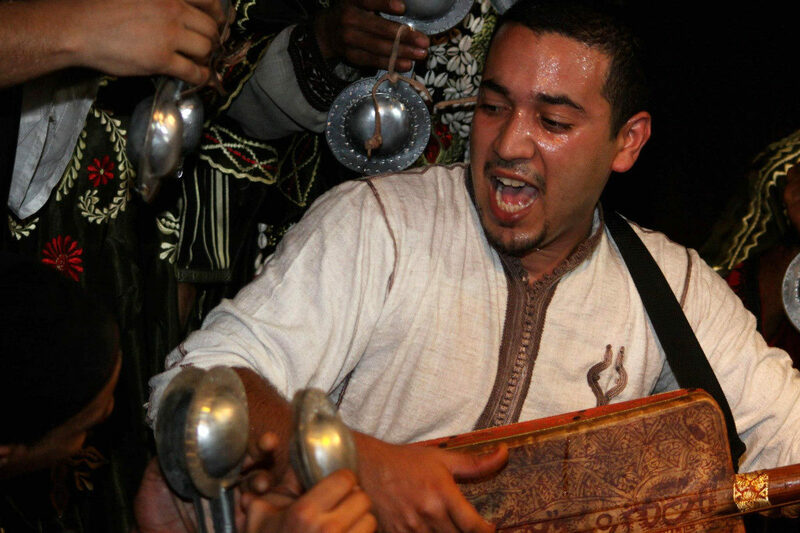 This talented young Artist and Gnawa Singer, Maâlemn, dances and plays several instruments, including the Hajhuj (Gembri, “gnawia bass”), Guitar, Mandolin, Percussion, … among others! He has formed a new band “Esprit Taguenwa” currently. He is touring alone like instrumentist or making collaboration with other musicians and bands and with his own and new band Esprit Taguenwa coloring stages and spaces worldwide with his particular musical touch.